Newly retired, Dad waited by the front door to take my mom grocery shopping. “Tom, you can’t wear that,” Mom exclaimed. “Why? Don’t I match?” he asked. A fair question, since Dad was notoriously color-challenged. But that wasn’t the problem. He’d donned a sport coat and a snazzy red tie with multicolored stripes. “Sweetheart, you’re retired. You don’t have to wear a tie every day anymore, especially not to the grocery store,” Mom explained. Disappointed, he removed the tie, but kept the jacket. He grew up picking cotton in Arkansas. As he labored in the sweltering heat, he dreamed of a different life – one that involved a desk job and wearing suits and ties. His career in the United States Air Force, followed by a career with the Washington State Department of Social and Health Services, allowed him to achieve his dreams. When he died in 1995, he’d amassed an amazing collection of neckties. My husband kept a couple, and most of them were donated to a local thrift shop. But I couldn’t part with all of them. I set aside a few dozen and gave them to some dear friends who incorporated them in a beautiful quilt. That quilt hung in my Mom’s bedroom until two years ago when she moved to a retirement facility. Now, it’s draped over our living room sofa where I can see it every day and think about how blessed I was to have a dad like mine. It’s also a daily reminder of the friends who took the time to create such a sweet remembrance. I love quilts, like my dad loved ties. The beauty, artistry and stories behind the patterns fascinate me. Sadly, when it comes to sewing, I’m all thumbs and totally lacking in skill or patience. Thankfully, I have friends who work magic with fabric, needle and thread. The necktie quilt isn’t my only memory-filled patchwork. Eleven years ago, our oldest son was struggling through adolescence. His actions and attitudes grieved me. I worried. I fretted. I prayed. That quilt kept me mindful of my son’s true nature. Every time I wrapped myself in it, I felt cocooned in the comfort of my friend’s love and prayers, evident in each tiny stitch. My husband has his own special quilt. A diagnosis of osteoarthritis in both hips a few years ago rocked him. A strong, active man, he struggled with the reality of a degenerative disease at a relatively young age. Bonnie, my sister-in-law, knows that pain all too well. So, she went into her sewing room and crafted a cat-covered quilt for Derek. Using masculine colors for the backing and border, the counterpane delighted both of us – especially when we spotted the cat curled up in a basket that looks just like our Thor. And recently, a new quilt arrived in the mail, made by an extremely talented, prolific quilter. Its vibrant colors brighten our bedroom, adding homespun cheer, and the accompanying note warmed my heart. “Thank you, dear friend, for all your glorious words which help so many,” she wrote. You can spend hundreds of dollars on beautifully pieced quilts, but the quilts in my home are priceless. Each one is threaded with memories, and has been stitched with prayer and bound with love. I’m not going to lie. I cried when I hugged him. And then I laughed when he grabbed his father and hoisted him off the ground in a bear hug. Derek is 6-foot-2 and 235 pounds. No one picks him up – except his second-born son who is an inch shorter and considerably lighter. Recently, we spent a week in Columbus, Ohio, with our son Alex, his fiancee Brooke and her 4-year-old daughter, Farrah. We’d planned the trip months ago, hoping to arrive when our grandson was a few weeks old. Sadly, Ian was stillborn on Feb. 23. I’d wanted to fly out immediately, but now I’m so glad we waited. Alex and Brooke needed that time alone to grieve, to rest and to begin to process the devastating loss. Our first day together happened to be the one-month anniversary of Ian’s death. We spent time looking at some photos of the baby that we hadn’t seen. Holding the tiny hat he’d worn. Shedding tears over the impossibly light container that held his remains. I was relieved to find how naturally Ian’s name was mentioned – that Alex and Brooke are able to talk about him. While their broken hearts will never be fully mended, talking about their son and his death shows they’re grieving in a healthy way and that will help the healing. Of course, our visit wasn’t all sad. Derek got to meet Farrah for the first time. As planned, one of the first things I did was bake an apple pie for my son. It’s been four years since he moved from Spokane – way too long for a boy to go without his favorite treat. While Brooke rested, and Alex and Derek caught up, Farrah helped me in the kitchen. She giggled as I sifted flour into the mixing bowl. “It’s snowing in the kitchen!” she squealed. And when I rolled out the crust, she eagerly helped “squish” it. The next day we treated Alex and Brooke to a date night, featuring dinner, a movie, and a long nap, and Derek and I earned our grandparenting gold stars by taking Farrah to Chuck E. Cheese. When she was pizza’d and soda’d up, we took her back to our hotel for a swim. Let’s just say Miss Farrah, Nana Cindy and Papa Derek all slept extremely well that night. Then we hit the road with Alex for a day trip to Cleveland. Our first stop was the “Christmas Story House,” the actual house where our family’s favorite holiday movie, “A Christmas Story,” was filmed. The home has been restored to its movie splendor, complete with the leg lamp, shining in the window. Visitors can pick up Ralphie’s official Daisy Red Ryder BB gun that’s tucked behind the Christmas tree, and climb into Randy’s hiding spot under the kitchen sink. Alex, 25, handled the BB gun without shooting his eye out, and squeezed into Randy’s cupboard. However, he declined to taste the Lifebuoy soap that rested in the bathroom soap dish. Having experienced his own soap-in-the-mouth experience as a child (Irish Spring), he didn’t feel inclined to risk soap poisoning again. From there we drove to the iconic Rock and Roll Hall of Fame, located on the shores of Lake Erie. We wandered through several floors of exhibits highlighting the history of rock ’n’ roll and celebrating the artists who influenced its development. My most pressing question (besides why Bon Jovi doesn’t have its own wing) remained unanswered until I returned home to Google it. Why is there a giant hot dog suspended in the middle of the museum? Turns out the 15-foot flying frankfurter was used as a prop by the band Phish. It must have wielded a strong influence over Derek. How else to explain why the following day he ordered the Big Dawg at the famed Thurman Cafe in Columbus? The 1-pound footlong Coney Island features the cafe’s Coney sauce – a secret family recipe that’s been homemade since 1942. Yes, he ate the whole thing, and didn’t even have heartburn later. On our last night in Columbus, I made Alex’s most requested birthday dinner – white chicken chili. The fragrance of garlic, onion and cumin filled the townhouse. “When Nana Cindy’s cooking in the kitchen I am starving!” Farrah said. All too soon it was time to say goodbye. We had laughed. We had cried. We’d made memories. I can’t think of a better way to honor Ian. Alex on top of the “E” at the Rock and Roll Hall of Fame. I knew I was in trouble when I read the sign for Ford Island and starting crying.After many years of interviewing and writing about Pearl Harbor Survivors I was for the first time, walking where they walked. My husband and I were celebrating our 30th anniversary on Oahu and Pearl Harbor was one of our first stops. 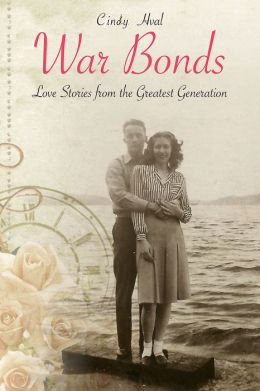 Chapter 11 of War Bonds: Love Stories From the Greatest Generation tells the story of Warren and Betty Schott who lived on Ford Island and both survived the horrific attack. I pictured Warren’s desperate drive to get his wife to safety. They’d spoken of shrapnel falling from the skies– of the road shredded by machine gun fire– of the terror and the noise. We watched a short film featuring actual footage of the attack. A scene of sailors and soldiers pulling the wounded and dead from the Harbor made me gasp. That’s what Warren had done in the aftermath– it was the one thing he didn’t want to discuss with me over the course of many interviews. It was the only thing he refused to speak of with his wife and best friend of 76 years. As we boarded the boat that took us to the USS Arizona, I thought of Pearl Harbor Survivor Ray Daves, who died in 2011. His friend George Maybee perished aboard the Arizona. His remains are entombed in the waters below the memorial. The throng of tourists quieted. The only sound was the snapping of the flag in the wind as I found Maybee’s name among the more than 1,000 names engraved. I wished I could tell Ray. All of the stories, all of the interviews over the years in no way prepared me for the magnitude, the solemness of this sacred place. Remember Pearl Harbor. Indeed, I will never forget this place, these people, their sacrifice. Here are links some of the stories I’ve written about those who survived the Day That Will Live in Infamy. I recently returned from the beautiful Skagit Valley in Washington State. The tulips weren’t in bloom yet, but the daffodils offered gleaming fields of gold! The workshop was for a regional meeting of Life Enrichment Directors from a large senior housing corporation. The purpose was to better equip the staff to preserve the precious stories of their residents. These folks are so aware that they are in a unique position to capture the stories of the men and women who served both at home and abroad during WWll. We covered basic interview how-to’s and discussed different formats for sharing the stories.Then we moved on to specific tools and prompts that make members of this generation feel more comfortable sharing as well as allow them easier access to their memories. I hope to offer this workshop in many senior housing or retirement facilities soon, as well as open it to the public at some point. Prior to the class I gave a War Bonds reading for the residents. Afterward, I spent time chatting with many of them and getting a glimpse of their stories. A lovely lady purchased a copy of the book for herself and her husband, Bill. Bill has Alzheimer’s, but enjoyed the reading. While he was unsure of the date or where he lived, he certainly knew his bride. “This is my sweet Eloise,” he said, beaming. Then he lifted her hand to his lips and kissed it. “Sweet Eloise” was a popular song 66 years ago, when they wed. Bill has lost a lot of his memories, but that song and his wife’s smile still shine through the fog of Alzheimer’s. I hope it always will.